The Geneva Motor Show has seen debuts of all shapes and sizes, so here’s another. 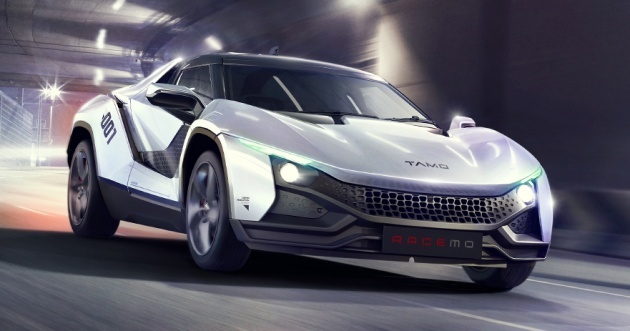 Meet the Racemo and Racemo+, the work of Tamo, a sub-brand introduced by Indian automaker Tata Motors, the company that owns Jaguar Land Rover. The Racemo is essentially a two-door, two-seat coupe that is “race car inspired,” as the company says in its press release. Designed at the Tata Motors Design Studio in Turin, Italy, the version of Racemo without the ‘+’ is the road-going version, while the other is the racing version. It isn’t hard to tell them apart, as the Racemo+ comes with plenty of racing kit stuck to it like aero front and rear bumpers, an adjustable front splitter, rear diffuser a sizeable rear wing, and a racing harness instead of three-point seatbelt on the inside (optional on the Racemo). Shared cues include a double-bubble roof, long bonnet a wide front intake, a central exhaust outlet and butterfly doors. 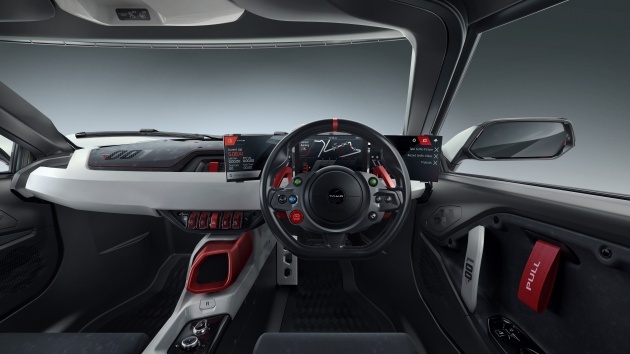 The cabin is pretty Spartan to suit the racing theme, where fabric door pulls, brightly-coloured switches and trim, and a triple-LCD screen instrument display are standard fitments. The car is built on what Tamo calls a MOFlex Multi-Material Sandwich (MMS) structure, which certainly sounds like a delicious offering, especially when you consider the car gets all around double-wishbones. Dimension wise, the Racemo measures 3,835 mm long, 1,810 mm wide and 1,208 mm tall, with a wheelbase of 2,430 mm. By comparison, a Mazda MX-5 (ND) is 3,915 mm long, 1,735 mm wide, 1,230 mm tall, with 2,310 mm wheelbase. Its small footprint should make it pretty lightweight although no official weight is given. For power, the Racemo comes with 1.2 litre turbocharged three-cylinder petrol engine that provides 190 PS at 6,500 rpm and 210 Nm at 2,500 rpm. The aluminium mill is mid-mounted and mated to a TA6300 automated manual transmission (with paddle shifters). 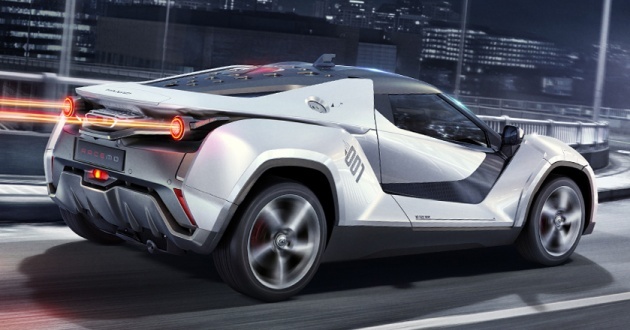 Tamo claims a 0-96 km/h (0-60 mph) time of less than six seconds. Aside from its suspension setup, the Racemo also comes with disc brakes at all four corners, and off-sized alloy wheels (17-inch front with 205/50 tyres and 18-inch rear with 235/45 tyres). What’s up with that gray plastic and the headlamps. Makes it looks cheap and ugly. Same boring story from ex proton operator who got fired. Boring. India gonna be the next “China”. When is Malaysia’s turn? Staggered tyres setup. 205/50 17′ front, 235/45 18′ rear. Only 250 will be built? Well, what a waste then… could have sold more than that I guess. It’s a 1.2 turbo engine with 190 ps, should be sipping petrol, would have been a practical daily sporty town car. All the money spent on R+D, and only 250 units will be built ?! Hopefully TATA will go on to sell a ‘scaled down’ version, more ‘user friendly’ in order to sell more units. Hopefully this is not a ‘pet project’ to boost egos. Yes, Indian engineers certainly posses the skills required to come up with world class products. Just look at NASA and Silicon Valley. It took Indian Leadership via sound strategy & investment, to drive JLR into a success storey. It took Mahindra to do the same with Ssangyong & Pininfarina. On the same note, Volvo cars under Chinese ownership. From a branding point of view, I’m not sure TAMO is the right name, could be looked at as a gimmick. Macam kereta Hotwheels. But thumbs up for the interior…. triple LCD display…. WOW! It looks like a fun car but am sure it will not worry any of the Big car producers. India has made great strides in the automotive industry. Dey Macha!! Lagi sekali siya tanya…mo race ka tamo race? It looks to me like the typical combination of Hotwheels and Speed Racer.